Well, I’ve been unusually productive on the sewing front this week and it was hard to choose which project to put up for Selvedge Saturday (of course you can see all of my latest projects over at my sewing blog if you feel so inclined to have a look-see, but give me a day to put them all up!) but in the end I chose the bag I made today. I created this pattern back in July (you can see the original bag here), but due to the Summery nature of the bag I hadn’t given it a real test run until recently. Now that the patten is been test driven and I know the bag is quite comfy and practical to use, I’ve whipped up another – with more on the way! 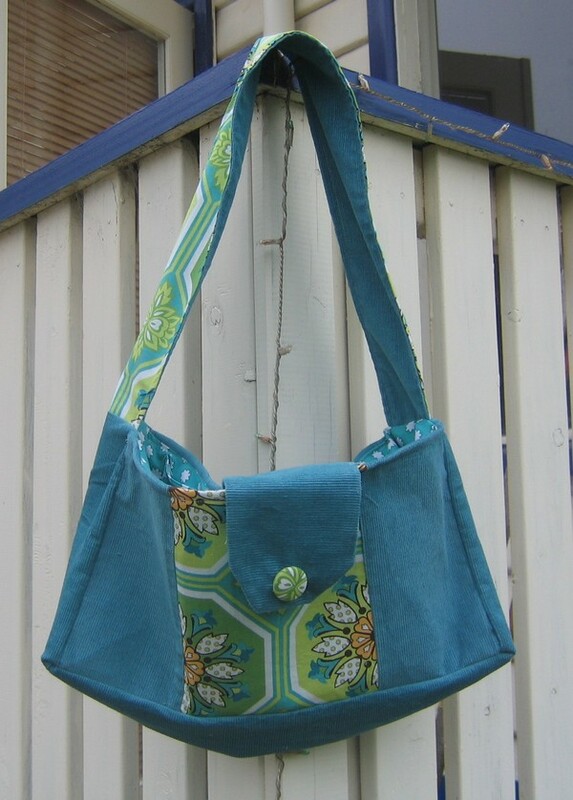 This one is made from a greeny blue corduroy with Sandi Henderson ‘Ginger Blossom’ fabrics for the accent, strap and lining. Very pretty bag- I love corduroy!